Make the most of your existing toolset and expand when appropriate. This post is meant to provide some insight regarding where I’m coming from with some of my other thoughts and posts. John Sonmez did a great post regarding “11 Rules All Programmers Should Live By” and that post resonated very well with me. I agree with all of his rules, and many of the below are similar if differently phrased. Be aware of the framework(s) that you are working in and the tools at your disposal. Leverage them to the maximum benefit for your business. If you are using a third party tool like the Telerik web controls or the Bootstrap responsive layout framework, make sure you are familiar with all of the different controls or elements within those frameworks. If you only know two items within the frameworks, you may be cheating the business or your application out of some very useful functionality that could benefit you greatly. Make sure you update any components in your toolset as they get updated (but test things as you do it, of course). A corollary of this point is that you should review the release notes to the extent possible to understand what has been changed in the new version. You may have some coding work to do in some cases — whether to deal with deprecated functionality or to take advantage of new features that have been made available. Yet another aside is that by staying current on any kind of framework (even the .Net framework itself), you effectively expand your own development shop by leveraging the resources that have been improving the frameworks you use. The converse of this is potentially a better way to illustrate the point — “our tools are A, B, and C and we are good with those.”. By adopting such an attitude you will almost certainly get left behind by advances that don’t necessarily fit into your existing tools. That isn’t to say just go out and jump on any new technologies or techniques that you see in the blogosphere or at tech conferences, but rather to objectively evaluate them and how they might apply to your business. We started out saying “we don’t need third party controls — we’ll just use the .net framework built in controls” for our applications. Then we started building and realized that our users wanted (and needed) the interactive and advanced features that were NOT available without custom coding on the core .net controls, but built-in and configurable on third party controls (we chose Telerik). Done. We wanted to expose our functionality on mobile devices but had not yet done so — we had websites, but they were old and did not use any modern frameworks. By updating our sites and using the Bootstrap framework we were able to make our websites great on mobile devices, but also have the SAME sites look great on tablets and desktops, and did not need to specifically invest in mobile application development. 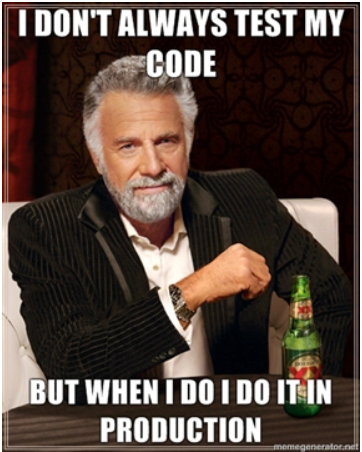 Ship your code to production frequently if possible (after testing, unless your are this guy). This makes release events not as impactful, risky, or traumatic as they would if you did, say, only one or two releases per year. And what you’re shipping should always be functional code using the minimum viable product/feature approach. We do monthly releases to production with on-demand interim releases when needed. We had a nebulous project with some broad goals and only a few specifics. Start with what you KNOW and build and ship it in its entirety, then let your understanding of the rest of what is needed evolve as you live with your shipped code being used in production. The business is better off as soon as you put your FIRST release into production. The most prominent cross-cutting concerns in my mind are database access, logging, security, and error handling. By centralizing these items in some kind of framework appropriate to your organization and adopting them across the various applications, you establish a common “language” that developers can speak even when moving between product / application assignments. And things are simpler for your support staff — the main differences between applications becomes business functionality rather than plumbing, logging, and/or security configuration. This goes along with the minimum viable product / feature concept, but I think it’s important enough to mention on its own. As fast as things change in this industry, the less code you have written the less overhead it is to take a different direction. And I’ve had my share of missteps along the way where I’m glad I didn’t have *too* much code written that had to be discarded in favor of a new approach. By building what you KNOW you need and not trying too hard to anticipate things that really might not become a reality you save yourself time to work on other more important known needs. If you’re deciding if or how to enable some complex configuration options for an applications, ask yourself how often you anticipate them changing. If you can’t honestly and confidently say “quite often” then you might consider NOT developing the configurability — just change the code when someone wants it changed. No one wants to maintain spaghetti code, but it ALL gets that way unless you make a conscious and ongoing effort to avoid it. If you have an application or some code that gets touched regularly, as it gets touched you should probably also review it to make sure that it adheres to your current coding and thinking standards (e.g. are functions small and tidy, are variable and method names meaningful, is the error handling / logging that it’s doing accurate). By investing this small effort on an ongoing basis, you should not really have any time where you need to block off an extended period just to rewrite or refactor code — which is always hard to convince the business to give you. The most frequently-touched code should be some of your most solid and the reason you’re touching it is because it’s a key and changing are of the business. If it is not, then evaluate for even deeper refactoring. Maybe the reason you’re having to touch it so often is because it is in need of deeper care and affection. Modern databases and improved hardware and network infrastructures have done a lot to help developers and the performance of their applications — even when the developers do not write their code efficiently. Take the time to make sure your code is efficient, and then address performance problems as they arise. A complex caching infrastructure can be important, but it does raise a lot of other questions and headaches that you might be able to completely avoid. NOTE: I’m not advocating “not caching” in general — but rather writing good code and then evaluating performance and caching when you find that you need to or that you’re trying to get more performance gains in a certain area. We *had* a very complex caching mechanism to store “configuration data” for an application once for each machine running the application. This made the cache very fast (in memory locally on a machine) but also had many complicating aspects of it — how to coordinate changes to multiple machines when a config value changed and what to do if the cache was somehow stale or corrupted. In our new approach, we simply don’t cache much and the database buffering and hardware / network speed make this a non-impactful change. What version are ALL of your databases running (includes patch levels)? How is the disk space on every drive on every server hosting your databases? How is the index health of your databases? Any long running stored procs that need attention? Where do most errors occur in your applications? What are the slowest transactions in your apps? How fast are the key transactions / activities in your apps? Which features are used the most? What times of day / days of week are your heaviest? How much concurrency do you currently have / support? What browsers are your customers using? Which features are most important to different types of customers? How often do you introduce an error to production? Have you identified root cause of any production errors? Are you delivering enough value to the business? When asked almost any interesting question about our line of work, the answer is often “it depends” and for good reason. Many factors go into providing an answer that the inquirer often believes is simple. So-called “cookie-cutter” approaches or “one size fits all” solutions are don’t always address the needs of *your* organization in the right way. The core principle here in my mind is that if you can’t justify why your are doing something in terms that your stakeholders can understand — not just “it’s the latest thing” — than you have no business doing that something. A developer on our team started down the path of using a factory pattern for some of the code he was working on — he had read about it and believed that it was important to use. When asked why he wanted to use it, he just said the same thing – he read about it and it seemed important. He couldn’t elaborate beyond this. It turned out NOT to make sense in this case and he didn’t have a very good grasp of when they should be used — the problem they are trying to address. If we are writing code “to write code” and not “solve a business problem in an efficient way” we are probably missing the mark. TypeScript, Bootstrap, and Kendo UI for jQuery – a powerful triple-threat!